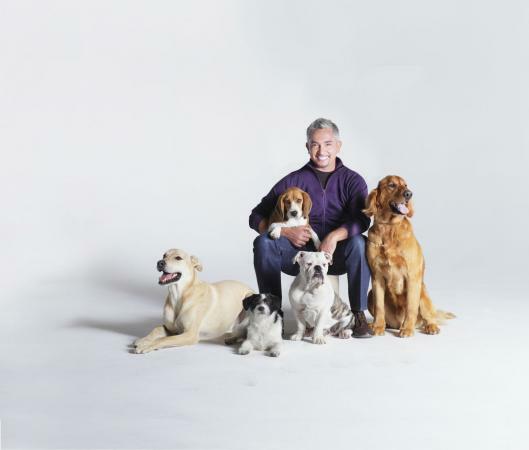 Jim Milio is one of the producers of National Geographic's The Dog Whisperer starring dog behavior expert Cesar Millan. Milio and partner Melissa Jo Peltier teamed up to write Dog Whisperer with Cesar Millan, an episode guide to this popular show's first three seasons. Even if you haven't been following the TV program, this book holds a wealth of information and tips for anyone who is experiencing behavior problems with a dog. The book is divided into sections addressing common issues, including dominance, aggression, fears/phobias and more. Each section contains details from related episodes as well as follow-ups on the dogs and more training tips from Cesar. Jim, how did Cesar Millan first come to your attention? In 2002, the Los Angeles Times ran an article about Cesar that resulted in a bunch of producers racing down to Cesar's Dog Psychology Center to try to sign up his rights for a TV series. As it happened, I knew the two producing partners who succeeded in getting Cesar's TV rights. I had worked with Sheila Emery when I produced the CBS series "Rescue 911" and I knew Kay Sumner because we had worked on the non-fiction committee at the Television Academy. Kay and Sheila needed a network-approved production company, so we partnered and went from there. What inspired you to put the Dog Whisperer show together? When Cesar came to our office, it became apparent at that first meeting that he had star qualities. We also were intrigued that his philosophy of exercise, discipline and affection had application outside the realm of dogs, and that a Cesar series would be more than simply a dog makeover type of show. You could apply his philosophy to other parts of your life. Describe a typical day's shooting. When we look back on our first season, we really don't see how we were able to accomplish so much in a ten to twelve hour shoot day. First, our crew would arrive and interview the owner(s) as well as film the dog's bad behavior. Next, we filmed Cesar interviewing the owners, something we came to call "the consultation". After that, we filmed Cesar working with the dog and owners until the problem was solved. Finally, we filmed follow-up interviews with Cesar and the owners. We would gobble down food during a half hour lunch break, then we would travel to the next owner's house and repeat the same process all over again. Since the second season, we now only shoot one story per day, but they often take ten to twelve hours because many of the stories are more complicated or require more complex solutions. Would you share one of the most memorable dog stories? I will always be partial to NuNu the demon Chihuahua. It was the first story we ever filmed, and I had to use my hand as the lure to try to get Nunu to show how he would attack anyone who came near his owner Tina Madden. When Cesar was there, Nunu turned into a growling gremlin, but Cesar worked his magic, and we got a great story. Luckily, I've never been bitten while working on the show, but Cesar and a few other crew members have! What do viewers typically miss "behind the scenes"? Not much actually. With Cesar, what you see is what you get. He is pretty much the same person when the cameras turn off. Also, we've been accused of "hiding the bad stuff" that happens, but the bad stuff is the first thing that goes into an episode. Many times we have to trim things for time purposes, but when we do, we often put up a clock that says something like "Elapsed time 11 minutes" so people understand that it didn't take eight hours for Cesar to change the dog's behavior. Tell us about your new book, Dog Whisperer with Cesar Millan: The Ultimate Episode Guide. Writing the episode guide was like going to a high school reunion and catching up with everybody! We feature every story from the first three seasons, along with follow-ups and Cesar tips. Anyone who likes the show would get a kick out of the book. Even though it is not a "how to fix your dog's problems" type of book, it is divided into common problem areas like aggression, anxiety, fear, etc., so it's easy to see how Cesar tackled those types of issues. What does the future hold for your production team and Cesar Millan? We are finishing up season four and it looks like season five is going to happen! We all love working on the show, and the positive feedback we get from the viewing audience is really gratifying. Our sincere thanks to everyone who watches "Dog Whisperer"! If you'd like your own copy of the Dog Whisperer with Cesar Millan: Ultimate Episode Guide, you can find it at the following retailers. A copy of Dog Whisperer with Cesar Milan was supplied for review at LTK Dogs by Fireside Books, a division of Simon and Schuster. Inc.